Kure Beach, NC.... Small town, Humble Memories. Every summer my husband and I take the kids to Kure Beach, NC. It's a small quaint little town right below Carolina Beach and Wrightsville Beach, North Carolina. What I love about Kure Beach is there are NO franchise chains. EVERYthing there is local. Restaurants, arcades, the pier, grocery stores, etc. The pier.... if you know anything about Kure Beach, it's Fort Fisher Pier. 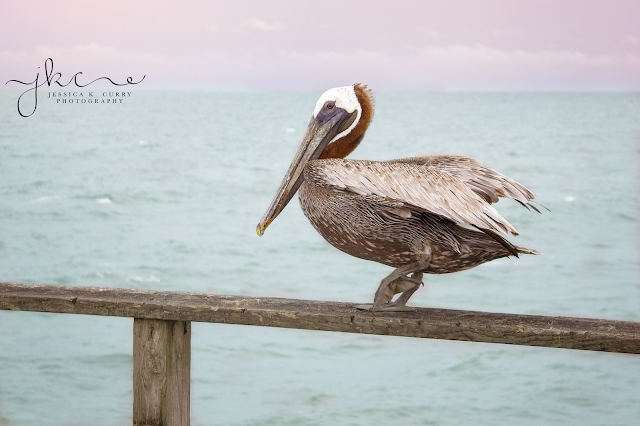 The old wooden planks, the smell of fish, fishing rods being cast every so many feet, pelican's perched on the railing waiting for a snack and ice cream being scooped in the Kure Beach Pier Store. You can even watch the live Kure Beach Cam. It's also not very far from Carolina Beach Aquarium at Fort Fisher. That's why I love the town of Kure Beach, NC. Everyone there is very close and look out for one another. After all, it is called "Pleasure Island". All of the beaches in North Carolina are just gorgeous! As a photographer who lives in Asheboro, NC, I can't wait to take pictures of the beach and pier! Even now, I am trying to imagine what types of pictures I plan on taking once I get there. The closest mass of water in Asheboro is Lake Lucas. Asheboro is located in Randolph County which is smack dab in the center of North Carolina. So you have to feel my excitement! Lake vs. ocean? Ocean! My favorite thing to do every morning is wake up super early, leave everyone in bed, make some coffee and go out on the balcony and smell the sweet salty ocean air. Then, after I had my coffee, pick up my Canon D70 camera and head to the beach. I bet you already knew this right? I look for unique picture opportunities such as sea shells, crabs, palm tree's or pelican's perched on the pier. Odd angles and different ways to make something so predictable look interesting. That's what photography is about. Art. 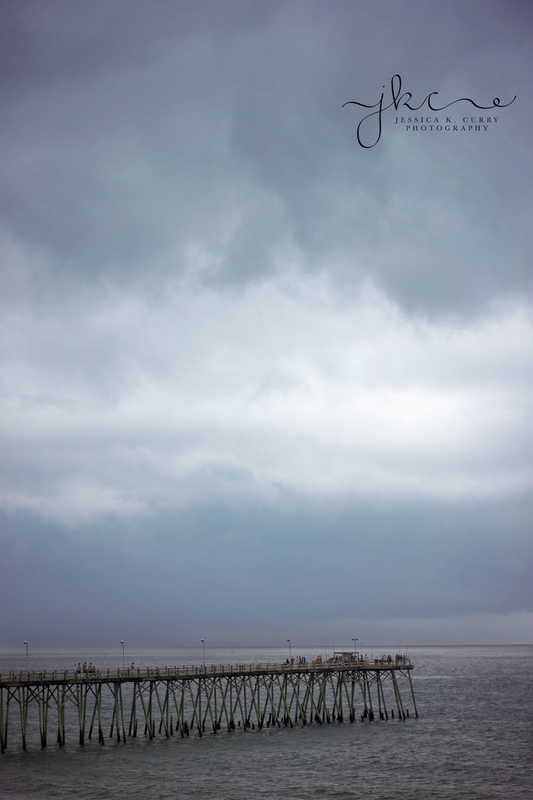 Here is some previous beach photography that I have taken there over the years. Hoping these shots take you back to your favorite vacation destination. If you have visited Kure beach, comment below your favorite places to visit and things to do there! Here is one of many pelican's that sit perched on the wood railing of the Fort Fisher Pier at Kure Beach waiting on one of the fishermen to toss up some yummy bait to eat. Here you can tell a storm was brewing. This is Fort Fisher Pier. 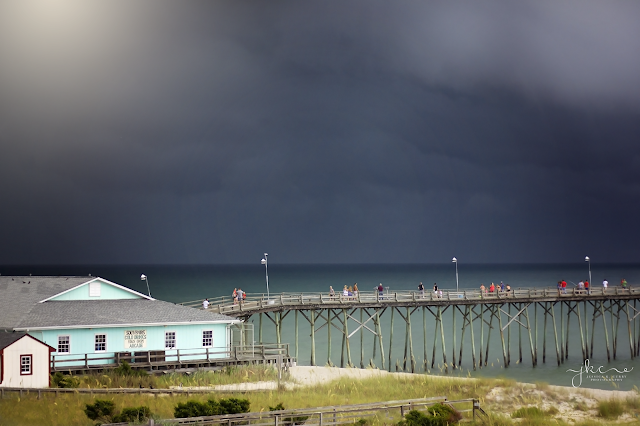 Another shot of the storm approaching but with the Kure Beach Store showing. They have great ice cream!